The Massachusetts Department of Transportation used accelerated bridge construction, prefabricated bridge elements and the design-build project delivery method to shrink a four-year bridge replacement project to just one summer. The $98 million project, dubbed "Fast 14," involves the rapid replacement of 14 deteriorated bridge superstructures along Interstate 93 in Medford, Mass., just north of Boston. The Massachusetts DOT received a Highways for LIFE grant from the Federal Highway Administration to use innovation on the project. Building the bridge superstructures in sections off site and installing them during 55-hour windows each weekend over the summer enabled the Massachusetts DOT to minimize impact on travelers who use the bridges, which carry up to 181,000 vehicles a day. Two lanes remained open in each direction on I-93 from 8 p.m. Friday to 5 a.m. Monday while work was under way, and work was scheduled so that it would not interfere with weekday rush-hour traffic. "This kind of innovation is exactly what President Obama means when he asks us to be smarter in the way we do business," said U.S. Transportation Secretary Ray LaHood. 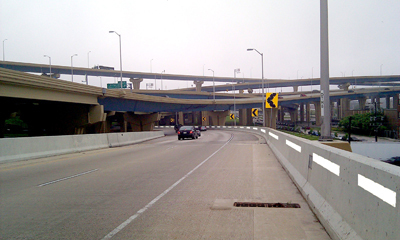 "Getting these bridges up and open to traffic quickly saves money and keeps traffic moving." FHWA Administrator Victor Mendez joined more than 150 transportation professionals from across the country to view progress halfway through the project. On a July weekend, they observed installation of prefabricated modular steel elements on I-93 south over Salem Street in Medford. The composite units—made of two steel beams and a precast concrete deck—were designed to be erected quickly by crane. "What we’re trying to do nationwide is find a different way to build," said Mendez. "These technologies help keep traffic moving, which lets people spend less time in their cars and have more time doing the things they enjoy." Crews used accelerated bridge construction techniques to replace 14 bridge superstructures in one summer in a Massachusetts Highways for LIFE project. Medford Mayor Michael McGlynn, also on hand to observe the bridge replacement, recalled that he saw the original bridge under construction. "It's being rebuilt a lot quicker than it was built the first time, so the process is working," he said. "Everyone is doing a great job." The transportation professionals—from 29 state highway agencies, FHWA, industry and universities—attended a workshop at which presenters from the Massachusetts DOT, FHWA and contractors discussed the innovations used on the project. The Fast 14 site visit and workshop were part of the ongoing showcase program sponsored by Highways for LIFE to give highway professionals a close-up look at innovations that can reduce construction congestion, improve safety and enhance quality. At these events, participants learn what it takes to deploy the innovations and observe the benefits in person. 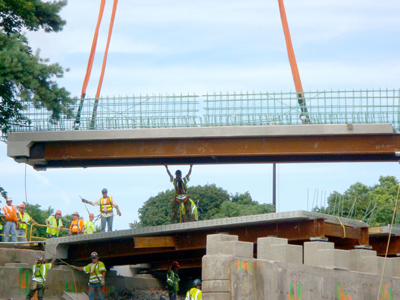 In addition to prefabricated modular structural elements for the bridge, the Massachusetts DOT used the design-build project delivery method, a contracting process that gives the designer-builder more responsibility and flexibility to innovate, to produce major time savings on the project. Construction of the bridges using conventional methods would have required about four years of construction and traffic congestion. As a result, the project was on track to significantly exceed the Highways for LIFE performance goal of a 50 percent cut in the duration of construction-related congestion. Using prefabricated bridge elements also was expected to enhance safety on the project by shifting a large portion of the work from the work zone to a factory setting. Using accelerated bridge construction methods and high early-strength concrete for longitudinal closure pours minimized the time workers spent erecting the structures and their exposure to work zone risks. 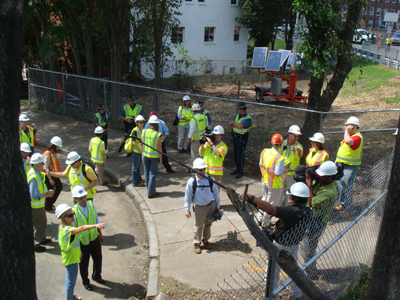 Transportation professionals from around the country came to Medford to observe the weekend installation of a new bridge on I-93 south over Salem Street. The prefabricated bridge elements were designed to provide a more durable structure than the existing bridges. Fabricating the units in a factory enables the concrete to cure in a controlled environment and produces a high-strength deck with a long service life. Throughout the summer, the Massachusetts DOT used a variety of strategies to communicate with residents, commuters and visitors about the project. The agency conducted briefings for communities and business, positioned variable message signs on intersecting roads to alert drivers to the work, and used intelligent work zone systems, road signs and billboards to let people know about the project. Outreach also included communication via a project web page, e-mails, news releases and a 511 traffic information line. The agency plans a post-construction survey to assess public satisfaction with the project delivery method and the finished product. 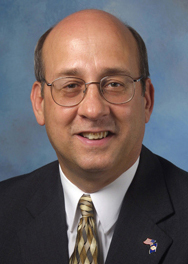 Malcolm T. Kerley, a 40-year veteran of the Virginia Department of Transportation, is the agency's chief engineer, responsible for assuring the quality, cost-effectiveness and timeliness of state transportation projects. He also chairs the American Association of State Highway and Transportation Officials Subcommittee on Bridges and Structures. He spoke with Innovator about using innovation to meet the challenges state highway agencies face. Why is innovation important to the success of the Virginia DOT? We look to innovation to maximize what we can do. VDOT is responsible for keeping Virginia moving. With the challenges that Virginia—and all states—have with funding and the need to assure the safety of the traveling public, we look to innovation to help us improve our transportation system. VDOT has a separate division—the Virginia Center for Transportation Innovation and Research—that allows us to not only answer problems of the day, but also look at what we might need to do in the future. Having VDOT staff dedicated to innovation and research gives us an opportunity to be on the forefront of new things that are coming out. How does innovation help the Virginia DOT handle the variety of transportation challenges across the state? VDOT has the third-largest state-maintained transportation system in the country after Texas and North Carolina. We've got the Golden Crescent area, which goes from Northern Virginia to Fredericksburg to Richmond down to Hampton Roads. Then we've got the western part of the state—Culpeper, Staunton, Bristol, Lynchburg and Salem Districts. So there are different challenges we have to address. The key is we only have a certain pot of money and we have to figure out how we can maintain the system we have, how we can expand the system and how we impact the quality of life of citizens in different areas. So we look to innovation. It's more than just engineering innovation. You've got the financial side of the house, too. On I-495 in Northern Virginia, we're adding both HOV (high-occupancy vehicle) and HOT (high-occupancy toll) lanes on a stretch of about 14 miles through a public-private partnership. We're also looking to convert our HOV lanes on the I-95 corridor to HOT lanes. From an engineering viewpoint, we look at using different types of materials and construction techniques like accelerated bridge construction. I'm a little biased because I'm a former bridge engineer, but ABC has probably been one of the highlights of the technology movement. We're also looking at new materials like high-performance concrete, high-performance steel and noncorrosive reinforcing steel. These are things that all states are looking at to minimize future maintenance costs and impacts on the traveling public. How do you encourage an innovative culture? We have advisory committees of staff from our central office and our district offices working with our research staff. They bring up concerns they have and make sure our research staff are looking at things that are important to field staff. With DOTs downsizing and most people from the interstate construction era of the 1960s now gone, institutional knowledge is being lost at state DOTs. So having the research center allows us to bring people together who have expertise in a particular area to not only resolve everyday challenges, but look ahead at issues we receive from our district and central office staff. And I always say 10 or 15 percent of the research staff's time should be spent looking ahead at where I'm not smart enough to think about. How do you use performance goals? We set up VDOT's Dashboard (http://dashboard.virginiadot.org/) several years ago. I think VDOT was one of the first states to develop a dashboard-type system. You can go on the Dashboard and see how we're performing. We set up goals on percent of deficient pavements, percent of structurally deficient bridges, and on-time and on-budget delivery, so VDOT has paralleled the whole movement of going to performance measures. What did you learn from participating in Highways for LIFE demonstration projects, one that used accelerated construction to replace a bridge in Prince William County and another that used precast concrete pavement slabs to speed rehabilitation of a section of I-66 in Fairfax County? 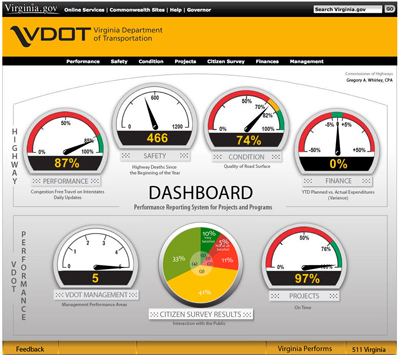 Virginia DOT’s Dashboard shows how the agency is doing in areas such as project delivery and customer satisfaction. On any of these projects that use innovation, you learn both from the products you're using and how you manage the projects. On the rapid replacement of the bridge, we probably should have done a more detailed as-built survey to make sure we had the proper fit in some areas. You have to do your up-front homework. You also have to make sure if you're going to do things more rapidly that you have the materials there when you need them. On our precast concrete pavement project we ran into some grouting issues. But both projects were successful for us and added to our knowledge of using those types of innovative construction techniques. Sometimes when you do a project, what you learn not to do is just as beneficial as what you learn you should do. What keeps the highway community from being as innovative as it could be? One thing is funding. I'll give you an example here in Virginia. When we instituted the Dashboard and on-time, on-budget delivery, that became a performance measure that was emphasized to our field staff. A negative result of that was when the research center would call and say "here is a product we need to try." Sometimes there was a reluctance to use the product because "we'll be late and over budget, the Dashboard will go to red, and we'll have to explain that to somebody." So when you institute new things, you have to remember that when you push a balloon in one area, it pops out in another. Unintended consequences can impact innovation. Another thing is that everything does not necessarily work like you think it's going to. The Highways for LIFE program emphasizes innovations that are already proven technologies, techniques or materials that just haven't gotten to mainstream yet. The reason they're not in the mainstream is because people may think there's a risk involved or additional costs. When you have budget and time concerns, they can impact innovation use. You can't do everything. But we have 50 states and if every one of them tried some new products, we could work some of the kinks out and use them in even more states. What advice would you give your counterparts in other states about using innovation? One thing is that you should always be looking ahead. You should always be looking for new techniques and new materials. Another thing is that you have to be willing to take some calculated risks. When I was state bridge engineer, I would ask Julius Volgyi, assistant state bridge engineer, from an engineering viewpoint if something we were considering was okay. I would ask Jose Gomez, now director of the research center, from a research viewpoint if it was okay. And if those two people told me it was okay, we'd try it. Once you've done your homework on good products, you need to go ahead and try them. Our motto is "We keep Virginia moving." I don't know how we could do that without looking at innovation and techniques like rapid replacement. Different states around the country are trying different things. Different geographic areas of the country have different requirements. Every state needs to use innovation based on what their philosophy is, what their funding is and what their situation is. In today's time of tight budgets and the need to do things quicker, you have to fight the urge not to use innovation. You may want to do something a particular way because you know it works as opposed to trying an innovation and maybe having a little problem. I would encourage people to take some chances. A new Technology Partnerships study will evaluate the safety benefits of a solar-powered traffic signage system designed to minimize crashes on horizontal curves. The Sequential Dynamic Curve Warning System, manufactured by Traffic & Parking Control Co., Inc. of Brown Deer, Wis., is the first product to undergo a Technology Partnerships safety product performance evaluation. TAPCO will install the system in several locations in partnership with transportation departments in Missouri, Texas, Washington State and Wisconsin. The Federal Highway Administration will contract with an independent research organization to evaluate the technology for two years. The resulting evaluation report will provide comprehensive performance information on the technology that highway agencies can use to make informed purchasing and installation decisions. The Sequential Dynamic Curve Warning System, the latest product to undergo a Technology Partnerships evaluation, is designed to limit roadway departure crashes on curves. Safety product performance evaluations assess the effectiveness of innovative road infrastructure safety technologies that are fully developed and market ready, but have had little use on U.S. roads. FHWA has also provided Technology Partnerships grants to private industry to help move late-stage prototypes designed to improve highway quality or safety or reduce construction congestion to the market faster. The Technology Partnerships program is part of the Highways for LIFE initiative to accelerate innovation use in the highway community. TAPCO's system uses LED-illuminated chevrons to provide drivers with advance warning of and guidance through horizontal curves. The system is designed to mitigate the high number of roadway departure crashes that occur on horizontal curves. Roadway departure crashes cause one-quarter of all highway fatalities. It is intended for installation on curves that have higher-than-average crash rates. Among the benefits that TAPCO cites are the system's cost-effectiveness, ease of installation and use of solar power, which eliminates electrical installation and operating costs. The company has installed several systems throughout the United States, and preliminary feedback has been positive. The Technology Partnerships study will evaluate the technology's effectiveness in reducing vehicle speeds and the frequency and severity of curve-related crashes.For more information on the Virginia project, go to www.fhwa.dot.gov/innovation/innovator/issue16. To learn more about precast concrete pavement systems, see www.fhwa.dot.gov/hfl/partnerships/bridgetech.cfm. For more information on Technology Partnerships, visit www.fhwa.dot.gov/hfl/partnerships, or contact Julie Zirlin at (202) 366-9105 or Julie.Zirlin@dot.gov. Highway professionals from 16 states learned from peers about the benefits and challenges of a relatively new method of project delivery known as construction management/general contracting at a Federal Highway Administration workshop. "The workshop was really a treasure trove of information about CM/GC," said workshop speaker James McMinimee, owner of JMC Consulting in Salt Lake City, Utah, and formerly with the Utah Department of Transportation. "I get notes from people who called the workshop the Woodstock of construction management/general contracting." The July event in Salt Lake City attracted about 65 participants—people experienced with CM/GC and those interested in starting it. With CM/GC, the contractor is hired early in the design process and participates in design as a member of the project team that includes the owner and designer. Many states have found that CM/GC gives contractors the opportunity to innovate and propose alternate construction methods. Highway agencies benefit from the improved constructability of projects and the expertise of contractors in material and methods selection. "And all parties benefit from the reduced risk that CM/GC brings with it," said McMinimee. "In the design phase, all three parties can talk about the risk of the project and take steps to mitigate it. States that have tried CM/GC report fewer change orders with CM/GC. " FHWA Deputy Administrator Gregory Nadeau praised CM/GC because it can speed up the rate of adoption of new technologies. CM/GC is one of 15 concepts and technologies targeted by FHWA's Every Day Counts initiative, which focuses on deploying innovations that shorten project delivery, enhance roadway safety and protect the environment. Wiley Bearup of the city of Phoenix reported excellent results with a project delivery method known as construction manager at risk, or CMAR, which closely resembles CM/GC. Phoenix has built hundreds of projects using the CMAR process. The city also uses design-bid-build, in which the agency contracts separately for the design and construction of projects. Bearup believes that improved relationships between the city and contractors—established with CMAR—carry over into the design-bid-build process. Terry Newell of the Utah DOT presented findings from what is called the nation's largest CM/GC project—the $450 million Mountain View Corridor project to build a ring road parallel to Interstate 15 in the Salt Lake City area. Overall savings from CM/GC have amounted to 18 percent of project costs because of reduced risks for the contractor. Of that 18 percent, savings from improved constructability and contractor-proposed innovations have saved the state 8 percent of project costs, Newell said. Contractors like the fact that they can influence design with the CM/GC process, said Cade Rowley of the Sundt Cos. Inc., a general contractor. And CM/GC eliminates the adversarial relations that can develop between contractor and designer in the design-bid-build process. "Instead of fighting about contracts, contractors can concentrate on building projects," Rowley said. McMinimee, who led the Utah DOT to launch 18 projects worth $350 million with CM/GC, presented the idea that CM/GC is closer to design-bid-build than it is to the design-build delivery process. "With CM/GC, you just hire the contractor early to be part of the design team," he said. How do states ensure that contractors don't charge excessive prices for construction? "States with experience have developed a method to show transparency in the contractor selection process," McMinimee said. "States have a process to ensure that they're getting good prices during the negotiation phase for the construction contract." With CM/GC, it is important for a DOT to have a strong and capable project manager, said Ben Acimovic of the Colorado DOT. He advised states to have a professionally facilitated partnering process so that the owner-designer-contractor collaboration can be more effective. Good partnering means "no blame, just solutions," Acimovic said. "Don't implement CM/GC with a low-bid attitude," said Bearup. "CM/GC requires a different attitude. Owners need to drop the adversarial thinking of the low-bid process." For more information on CM/GC, see www.fhwa.dot.gov/innovation/everydaycounts/edc-2/cmgc.cfm. Speakers Terry Newell, Gregory Nadeau and James Mcminimee explored CM/GC contracting at an FHWA workshop. The use of full-depth precast concrete panels, post-tensioned with high-strength steel bars, will slash the closure time for replacing a New Hampshire bridge deck to just 60 hours. The New Hampshire Department of Transportation plans to use an innovative method that involves post-tensioning the panels incrementally—one at a time—instead of all panels at once, as strand post-tensioning requires. By contrast, if cast-in-place methods were used, new deck construction for the 80-foot-long (24.3-meter-long) bridge would require an entire season, said David Scott, in-house design chief for the New Hampshire DOT's Bridge Design Bureau. Only the deck will be replaced on this two-lane bridge on U.S. Route 3/NH Route 11 in Gilford. The agency was awarded a Highways for LIFE grant for its use of innovation on the $1.5 million project, estimated to start construction in April 2012. "I am hoping to demonstrate that we can replace bridge decks incrementally, by removing and replacing one section at a time," Scott said. "That way, we could remove only a portion of a deck in one night, replace that portion with precast panels, post-tension them with coupled steel bars, then reopen the bridge for traffic in the morning. By repeating that process over successive nights, we could replace an entire bridge deck, one section at a time." Post-tensioning with strand requires an entire bridge deck to be removed and redecked before post-tensioning can occur. That method requires a longer bridge closure period. A second innovation at the Gilford bridge will happen at the joints between precast panels. Instead of using a transverse shear key filled with cementitious grout, the contractor will use epoxy adhesive to fill the void of the transverse joint. "We have come up with a tongue-and-groove configuration for the panel joints that will minimize the amount of adhesive that we need while still allowing for construction tolerances," said Scott. The Gilford bridge will require nine panels, made with high-performance concrete, that each extend the full width of the bridge. "This project has been a partnership with the University of New Hampshire," said Scott. "Their role is to help with the design of the panels, to monitor the bridge long-term, and to monitor the strain of the girders during construction." The nine panels will span across seven stringers, or steel girders. When the old deck is removed, the girders will rebound, or arch upward slightly. That is called camber in the girders. When the precast concrete panels are set down on the girders, leveling screws protrude beneath the panels and should come to rest on the girders. Differential camber in the girders can mean that one or more panels' leveling screws do not all come to rest on all girders at the same time, Scott explained. In effect, a panel might get hung up on three or four girders and not rest on the others. That would place excessive strain on the girders that the panels do rest on. "The university will monitor the bridge during construction to make sure we don't overstress any of the girders," said Scott. Adjustments can be made with the leveling screws to compensate for over-camber in the girders. Using the precast panels to replace the deck will minimize construction time, reducing the duration of the work zone and the chances for work zone crashes, Scott said. Traffic will use off- and on-ramps to detour around the Gilford bridge construction site. After reading "Intelligent Asphalt Compaction Analyzer Offers Real-Time Quality Control" in the July/August 2011 Innovator, several readers had questions on the IACA technology relating to density values, use in the acceptance process and availability of the technology. First, the IACA was developed only as a tool to assist contractors in hot-mix asphalt paving operations. The IACA is an empirical process that does not determine the actual compaction or density of paving materials. The IACA requires a test strip to correlate IACA accelerometer-based measurements with in situ spot field measurements to extrapolate measurement values displayed during real-time rolling operations. Second, the Federal Highway Administration has determined that the IACA is not intended to be used for acceptance of paving operations by highway agencies. Third, the roller manufacturer, Volvo Construction Equipment Co., plans to introduce the IACA as an option on new compactors in the future. For more information on the IACA Technology Partnerships project, contact Julie Zirlin at Julie.Zirlin@dot.gov or (202) 366-9105. 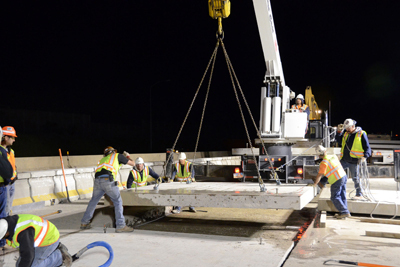 The Utah Department of Transportation demonstrated rapid repair of concrete pavement with precast panels at a Highways for LIFE showcase in Salt Lake City. More than 200 transportation professionals from across the United States took advantage of the opportunity to learn about the design, construction and installation of a new type of precast panels on a section of Interstate 215. The panels speed up the repair process, minimize traffic disruption and boost durability. For more on the showcase, scan the QR code with your mobile device.